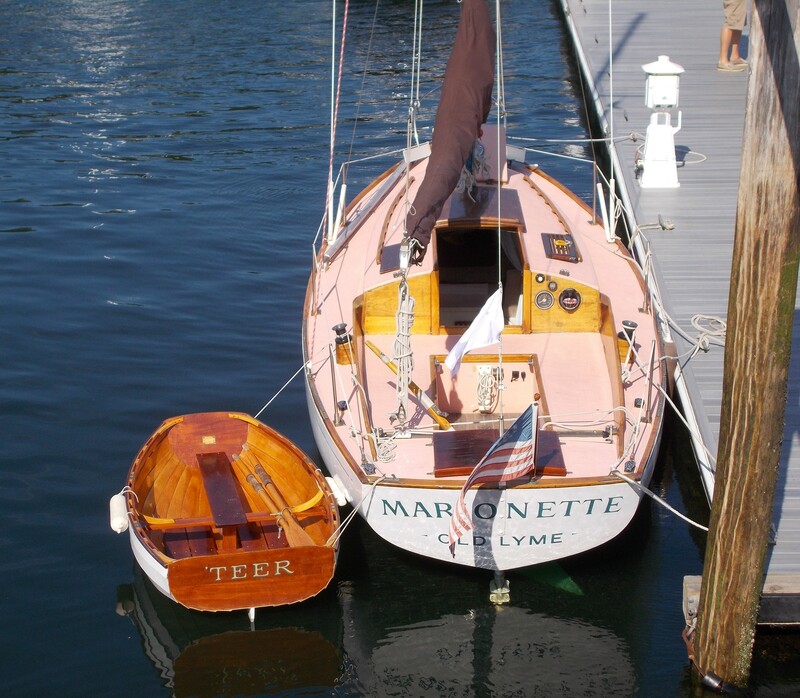 A pretty boat needs a pretty dinghy. I think we got it just about right, don't you? She is a Feather Pram, an Ian Oughtred Design, #51. 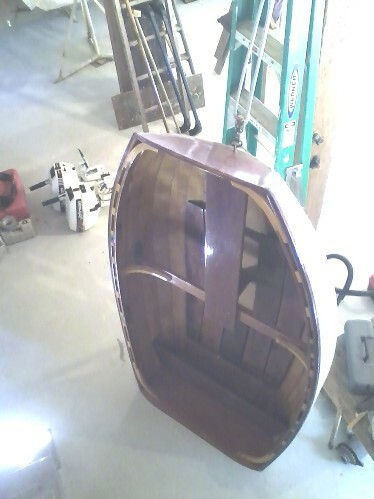 The lap strakes are made of 1/4", 5 ply Brunzeel Okume plywood, edge beveled and epoxy glued. 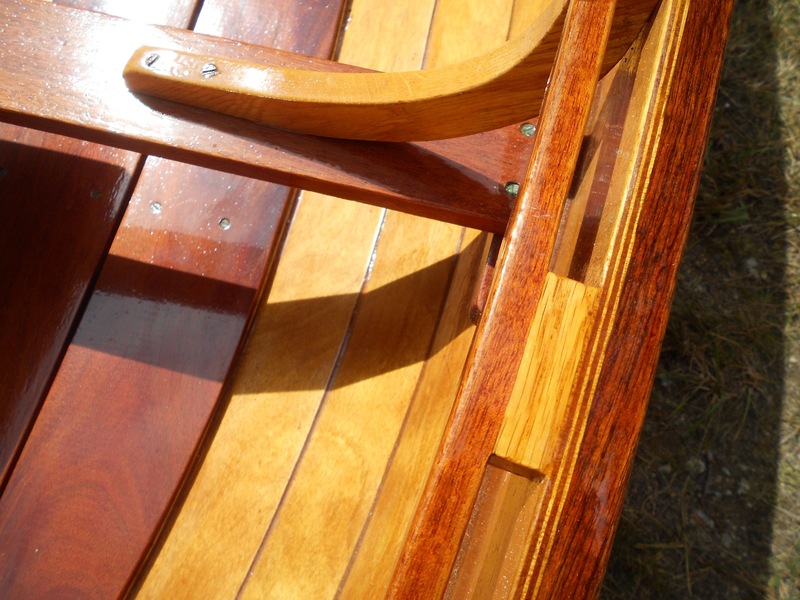 She has mahogany transoms, seats, floor boards and rail trim (with oak inserts and carrying handles built into the rail), weighs only 42 lbs and has a load capacity of 350 lbs. She has two rowing positions and Shaw & Tenney clear spruce oars with sown leathers. 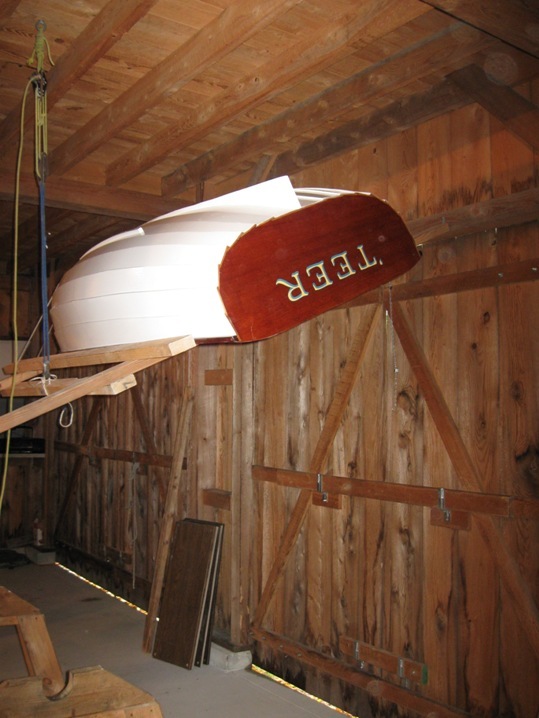 You can just see the little brass nameplate shining on the inner side of the forward transom. It is extremely important. It says built by me. I know the difference between a hammer and a screw driver so I do have some know how. 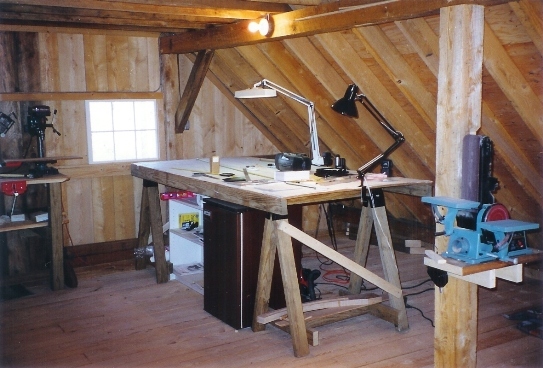 As the Barn project developed it seemed natural to have a work shop above - nothing really fancy but functional. Details are in the Marionette's Barn story. 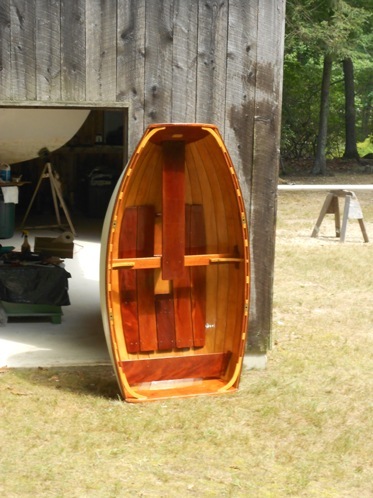 So in the winter of 1998/99, l signed up for the John Gardner boat building course at Mystic Seaport and it seemed I might really be able to build a dinghy, probably from a kit. 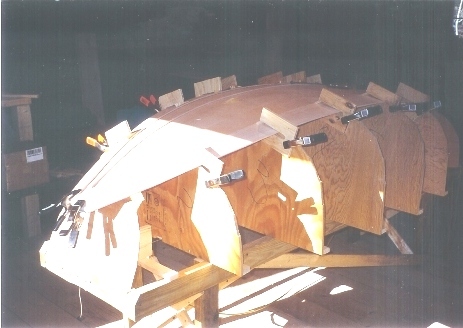 But, after a little research looking at kits and other designs, I found Ian Oughtred's Feather Pram and it seemed John Gardner would have wanted me to build her from scratch. The plans (click here to see some detail) came with good instructions on how to build the molds and a table on which the molds would set. My 'lofting' table complete with fridge base was a 4' x 8' sheet of plywood that originally I could tilt up so I could complete the image. I could not figure out how to keep my pencils and beer from slipping off so its flat. Worked fine. 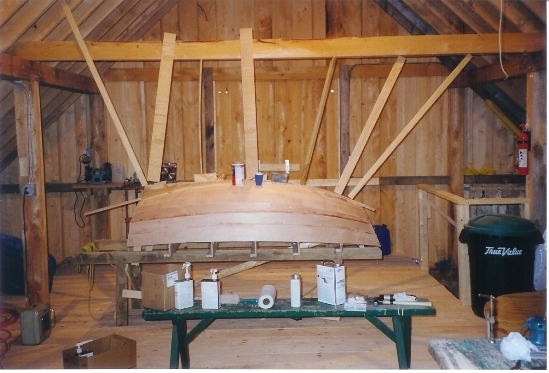 The boat gets built upside down. I had to make lots of wood c-clamps, plus if you look closely, little wedges that hold the beveled strakes in place against each other and on the molds. I made the molds from full size plans. One great idea someone gave me was to first cut and fit the strakes over the molds using plain old, cheap 1/4" plywood - Brunzeel plywood is very expensive. 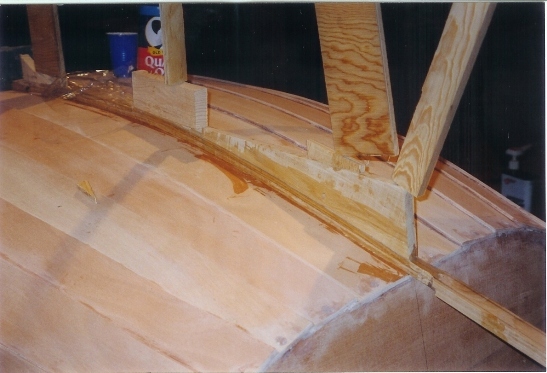 Note: It also bends uniformly making it easier to form the strakes over the molds than the 3 ply cheap plywood. 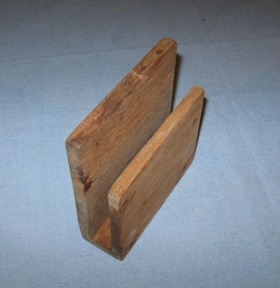 In order to minimize wasting wood it helped to layout the all cheap plywood strakes on the sheet of Brunzeel, nesting the strakes against each other. 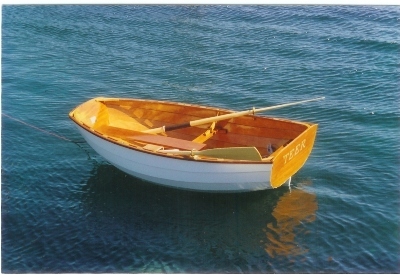 I thought about making another boat of cheap plywood but came to my senses. The strakes can take weird shapes as the next picture shows. 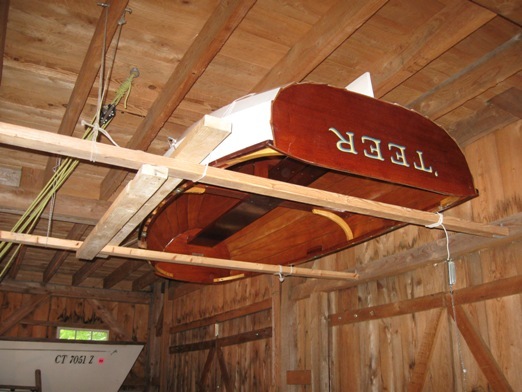 The open overhead beams at one end of the wood shop were a great way to anchor the verticals that held the garboard strakes in place while the epoxy was drying. This shot gives you a good look at the table frame on which the molds were placed. 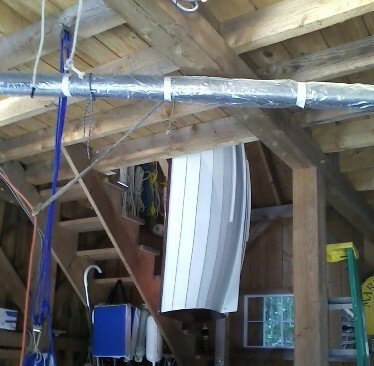 This vertical support system also helped hold the keel(s) and skeg in place. This project was done in late winter - early spring. The barn has power but no heat except a couple of kerosene heaters I used on the cold days. The varnish and paint drying room was made of clear plastic and pretty basic, but it worked. Sometimes I used a small electric space heater set up in the middle of the drying room. Spring type clothes pins work well in the corners. 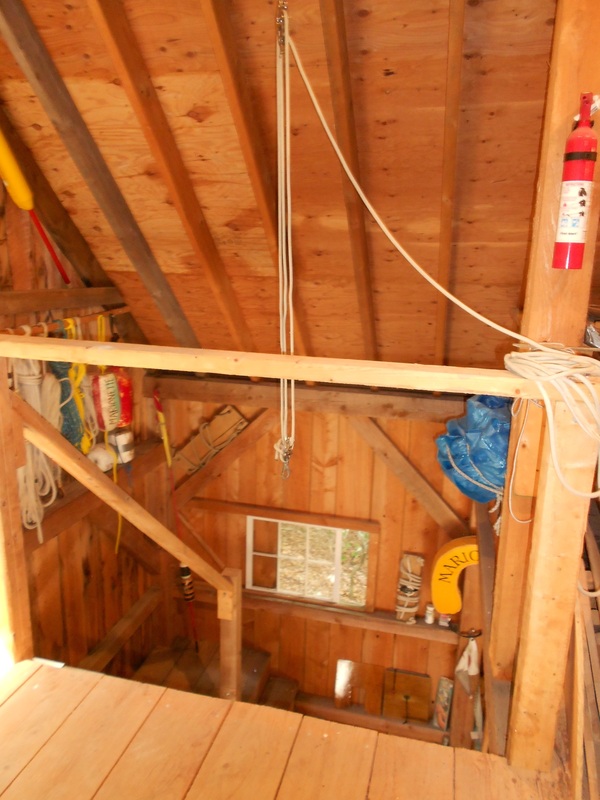 Above the open double doors is an old lobster pot pulling block hanging from an extended ridgepole. The dinghy could have been carried down the stairs on the right but, of course, she had to be lowered to the ground in the time honored way. The decision to use clear vanish for the total inside instead of just on the seats, floor boards, transoms and trim was accidental. The instruction book called for paint. 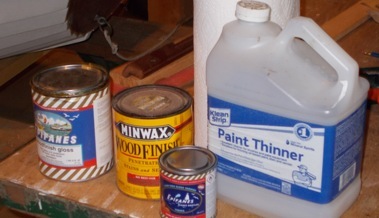 It also called for careful cleaning on the bevel joints to avoid unsightly epoxy build up. When doing this with mineral spirits I noticed how the color changed to a rich light brown. So I decided to varnish her. I am very happy with that decision. 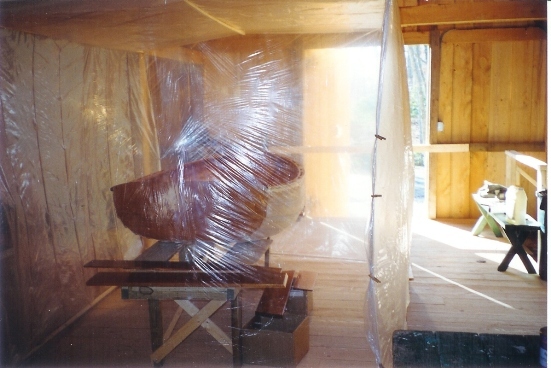 It's the summer of 1999 and the builder above is on route to test floatability. 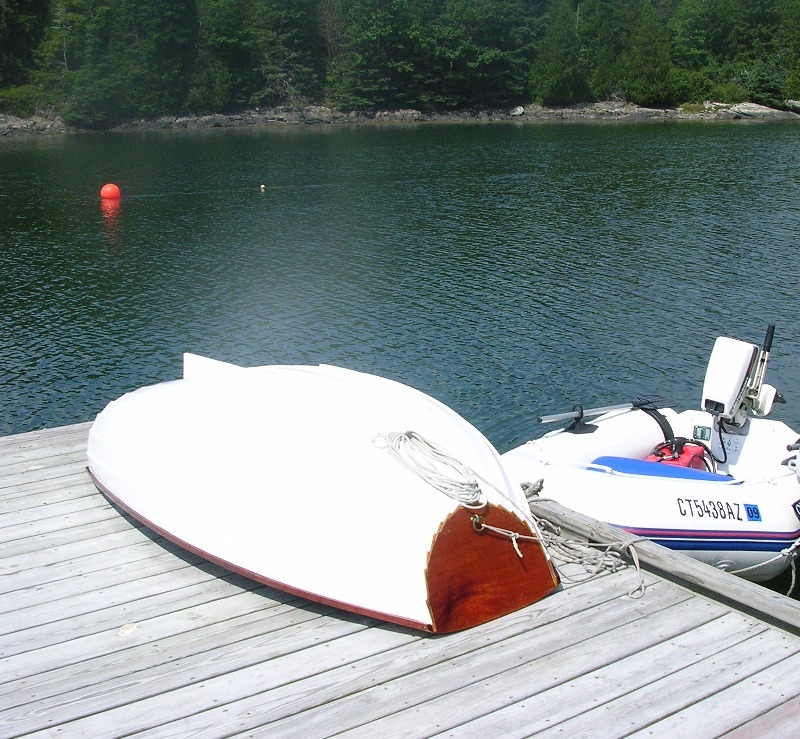 Its a bit tricky but you can get this dinghy on the car rack all by yourself. Launching date - June 8, 1999. She floats! 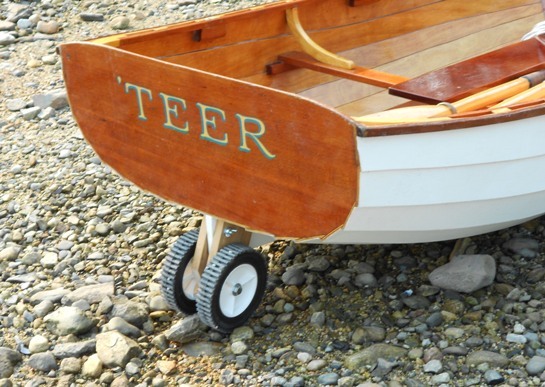 Now, have you figured out why the dinghy's name is 'TEER? October 5, 2008 - Truth Telling Time. 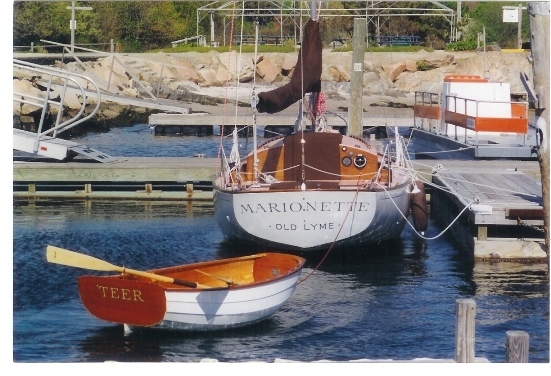 One of the reason's the Feather Pram design was selected for 'Teer is that she would fit on Marionette's foredeck so I would not have to tow her on long passages. Its been 10 years and she has never been 'up there'. She gets to Maine on the top of our station wagon and, after I get there, I tow her everywhere. Marionette carries Pup, a really great small inflatable in her port quarterberth for the 250/300+ mile cruise up the coast. 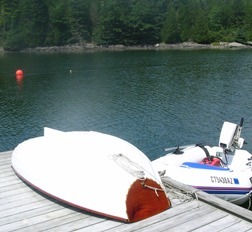 Here are both of them on Weir Cove, off Eggemoggin Reach near Bucks Harbor, Maine. Click for a larger picture. I never inflate her until I get to the Reach because, on the 7 day trip up, I always get a slip at a marina, or hospitable YC. Going ashore for a shower and then a beer and something to eat at the local pub after 'long day at sea' is high on my list of things to do. To find out all about Pup, click here. 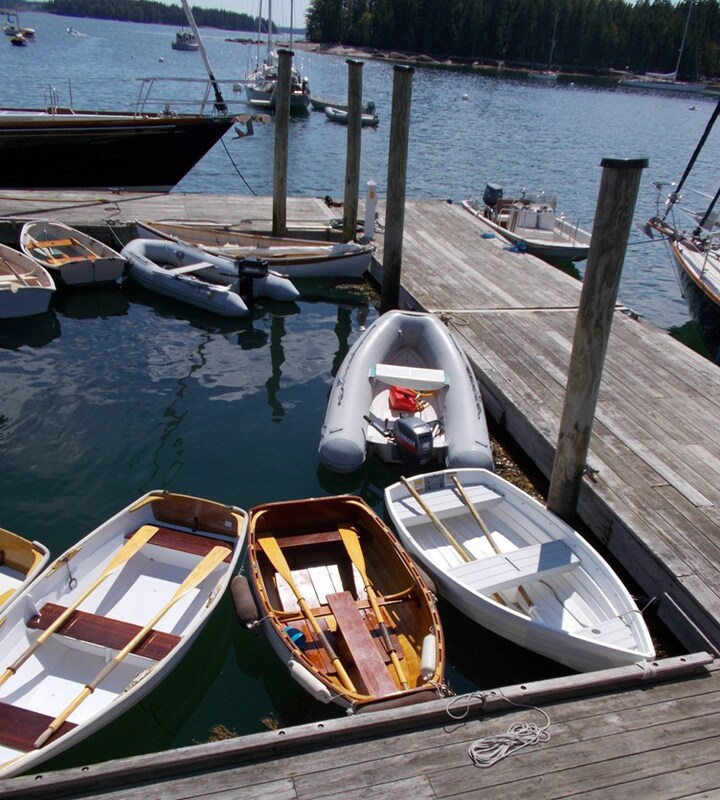 Note: A small diversion - that's Marionette's 4 hp Johnson on the inflatable's transom (above left). 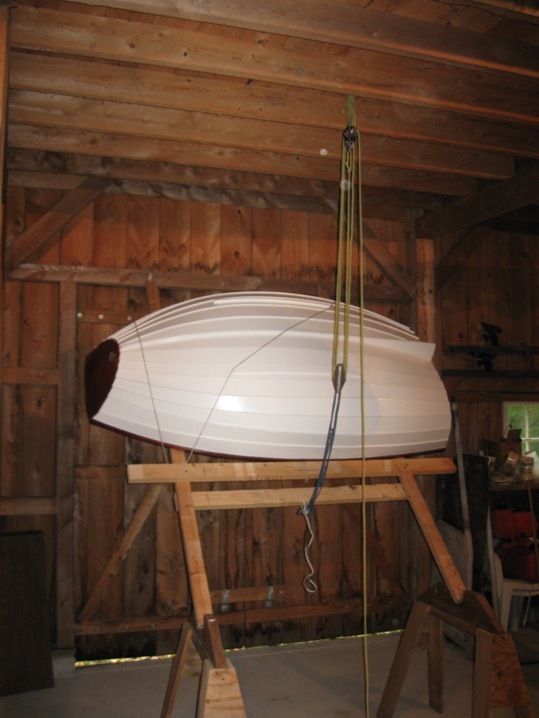 One might ask if and how this motor fits on 'TEER's transom. It does and here is how. This 'bracket' fits over the transom. Click here to see a larger view and more on this. 'TEER may be pretty but she is not fast towing. In a flat sea, no wind and motoring, I am about .5 knots slower than not towing her. Varying the length or attachment height seemed to make no difference.That dinghy throws off a lot bigger stern wake than Marionette does - Marionette's wake is negligible. 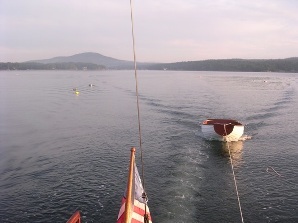 This picture is 6AM, flat calm, motoring, leaving Blue Hill, dodging lobster pot buoys. 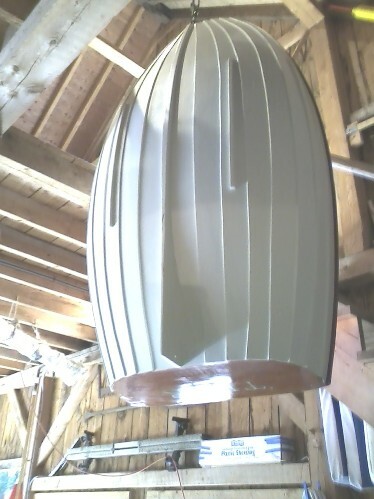 Her design towing eye is low, about 2" above the bottom of the front transom. The bridle was set up to test height effect. Strangely, she rows and handles beautifully - maybe she needs 200 lbs of ballast when being towed? 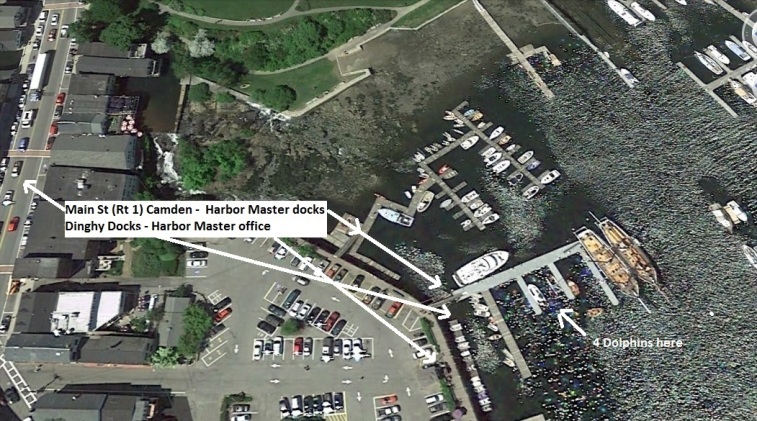 But, she did her job in Maine - that was to make me feel good towing her through a mooring field, or passing under a bridge with people lined up watching, or rowing her from a mooring to some yacht club or town dock, or hanging off Marionette's transom as the Hinckleys motored by. 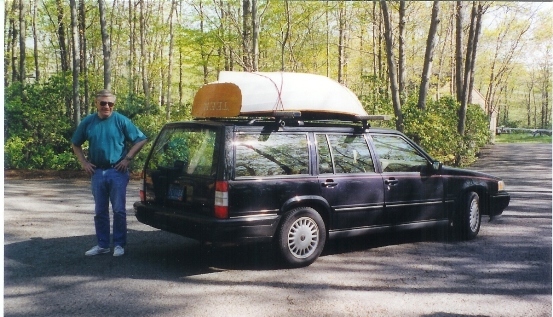 She came back from Boothbay, Maine on a roof rack. 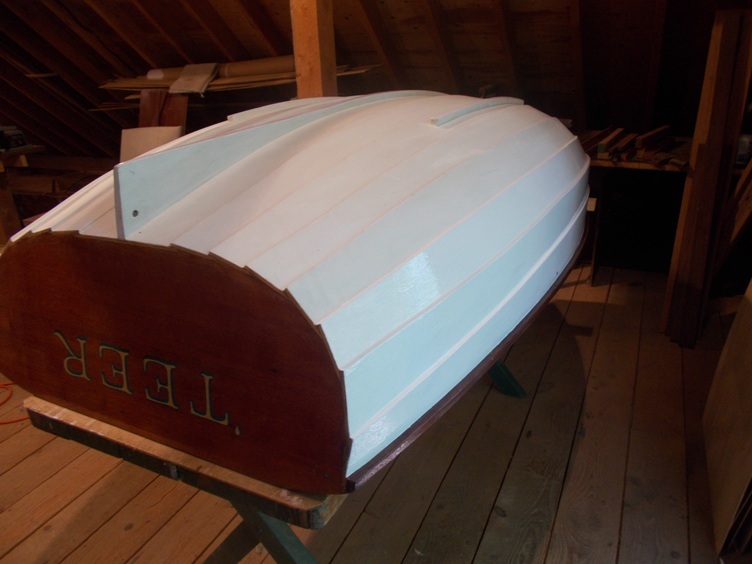 After sanding her bottom and a new coat of paint - Benjamin & Moore's High Gloss Exterior White Enamel, and some varnish touchup, she was ready for her winter nap. 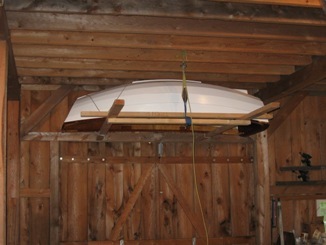 Normally, this winter nap was taken standing on her transom on a couple of old lifejackets leaning against the barn wall. The decision to move Passage into the barn and get serious about her restoration meant freeing up some space for a temporary Ist floor workshop in the next bay. Efficient use of ample available cubic space was called for. 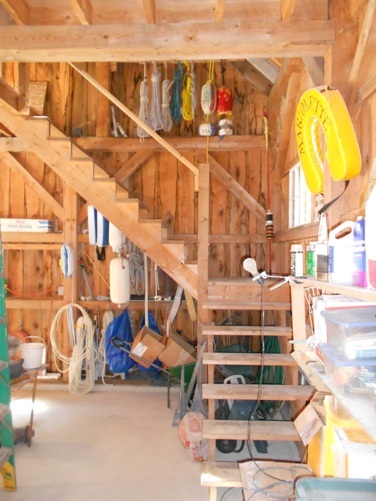 Those 2 x 4s are hinged to the beam above the barn doors and the rack is swung up using the block and tackle. 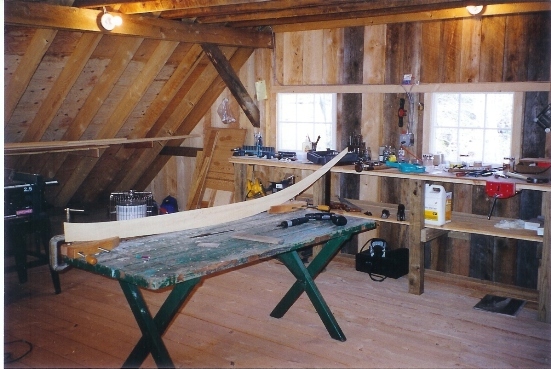 Two lines are fastened to the joists and looped around the 2 x 4 extensions. 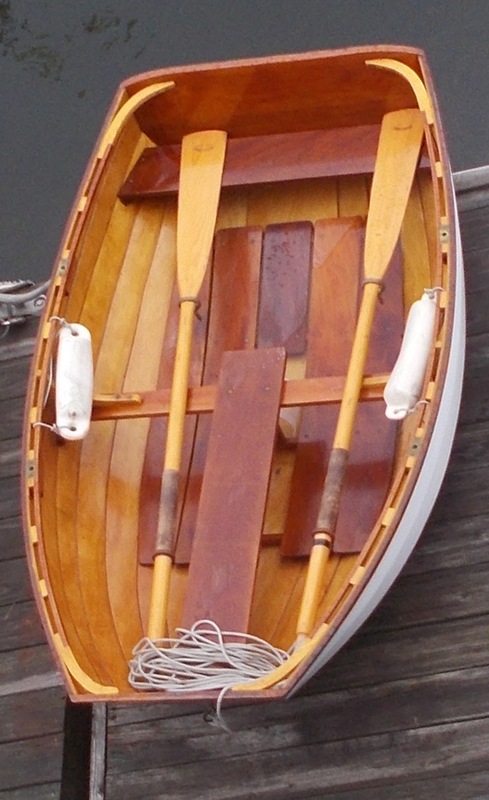 The Shaw and Tenny oars with leather uppers will slide in next to her and, with a plastic drop cover over her bottom, she's ready for her nap. 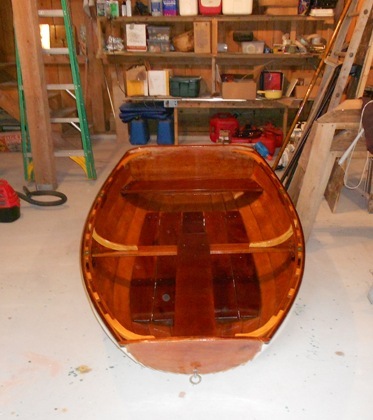 Occasional vistors can look up and marvel at her varnished transoms, seats, floor boards, trim, etc., and provide the owner necessary nourishment for additional boat related projects - nez pas? 'TEER was shown off at the 2009 Wooden Boat Show at Mystic Seaport Mystic, Connecticut. Click here to go there. 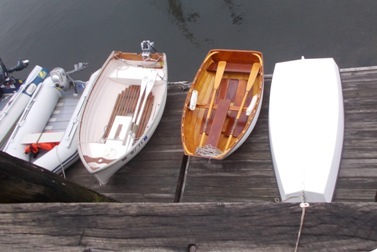 June 26, 2010 - Today at the 2010 Wooden Boat Show, also at Mystic Seaport, I met Ian Oughtred, designer of the Feather Pram. 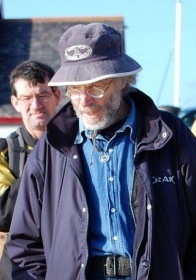 Picture at left from Wordpress/scottish-coastal-rowing-project, Oct 31, 2009, courtesy of Chris Perkins (attribution, May 5, 2011). 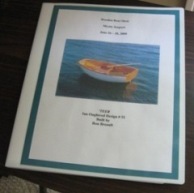 Among other things we talked about towing eye location on this dinghy, and, I showed him a copy of the 'TEER project booklet prepared for the 2009 Boat Show. Click the link above to go there. October 6, 2011. 'TEER has a dolly - we call it a skeg dolly. Below is a picture. The story and 'technology" behind this dolly is covered in a dedicated page in the Technical Section. Click here to go there. July 27, 2014. 'TEER was stored for the winter in the upstairs Barn workshop. 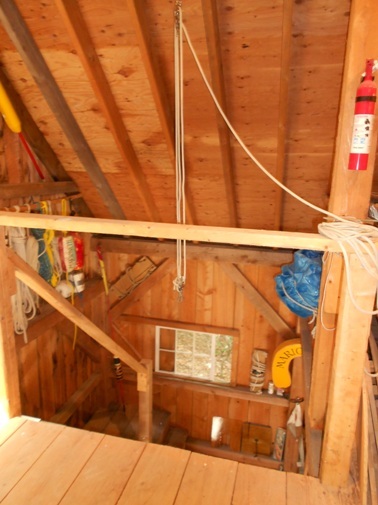 Getting her down single handed tested the original barn design - a corner stairwell open to the rafters with a block and tackle set up just for this reason. This 42 lb dinghy is easily carried by 2 people - awkwardly carried by only one in tight quarters. 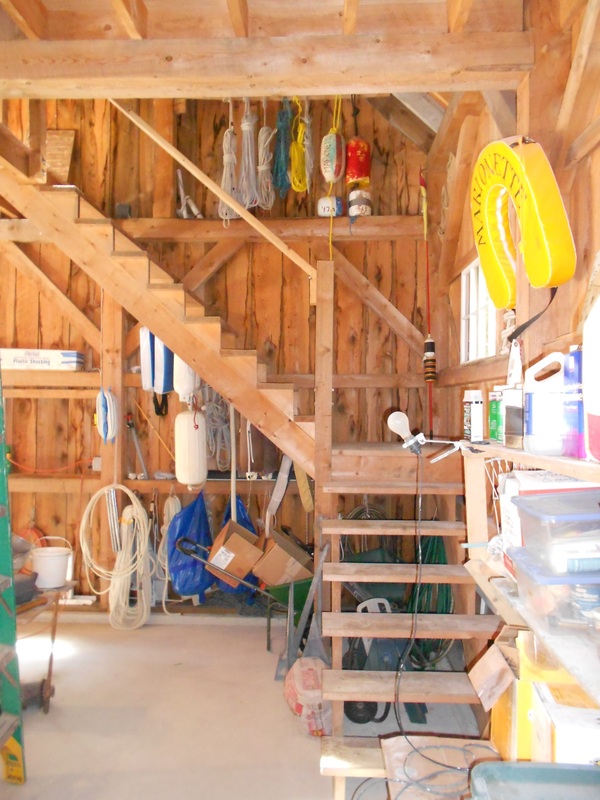 The boat was stored upside down on low, old picnic bench seats and was fairly easily wrestled on to the rail at the top of the barn stairs stairwell. A video here would have been nice - basically I picked up the transom end and walked my end of the boat down the stair railing. The boat only weighs 42 lbs so it was easy, but a bit awkward. It got up here with 2 guys carrying it - really easy..
Click on the immediately above pictures for a larger view. June 25/27, 2017 Speaking of Maine, last year on our Maine cruise (check out Marionette's Log, 2016) 'TEER took a 'beating' at the dinghy dock at Brooklin Boat Yard in Center Harbor out on the east end of Eggemoggin Reach. 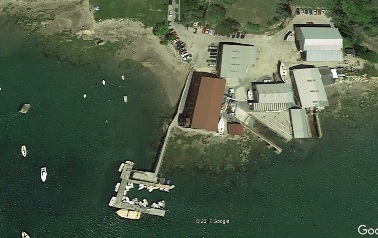 We were there over a month with Marionette out on a mooring and 'TEER at the dinghy dock. 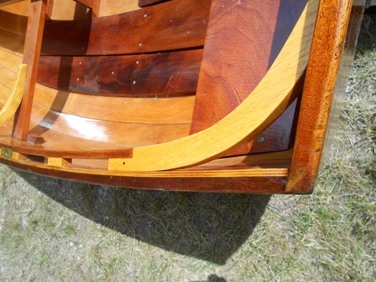 Even though I had 2 horizontal fenders out on both sides her neighbors managed to chip away at her mahogany trim when I was not there - my fault, she was not properly protected. Will need a better system this year.....any ideas???? Somehow, we got thru the winter avoiding the inevitable - but now the inevitable is here. We leave for Maine in less than a month. She needs to be prettied up. 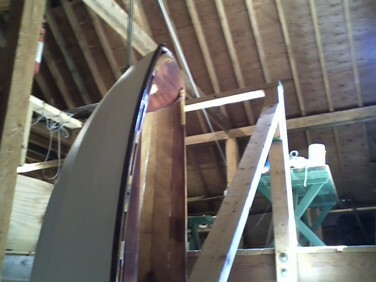 Today I washed her with paint thinner and sanded her rails and forward transom. 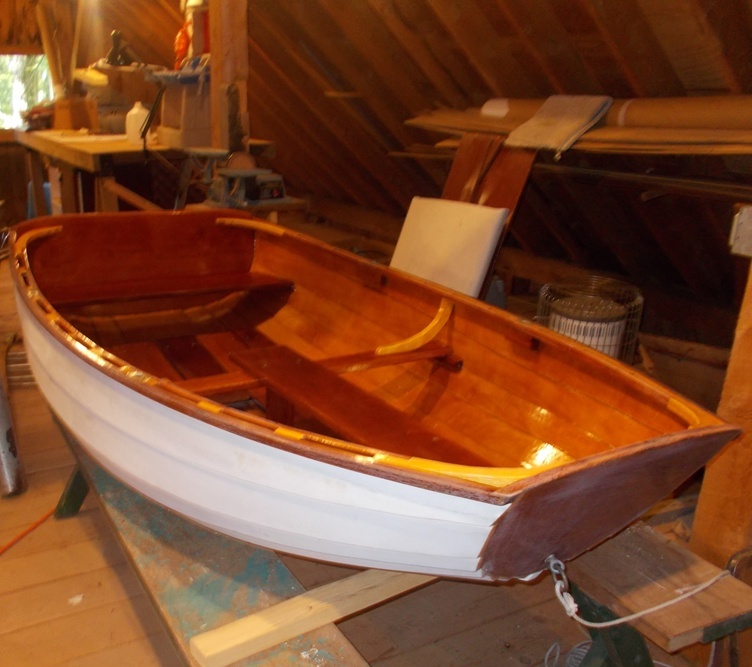 Tommorrow, I hope, the first coat of varnish. Reader satisfaction is our goal. How's she look? Did the job get done? December 30, 2017. 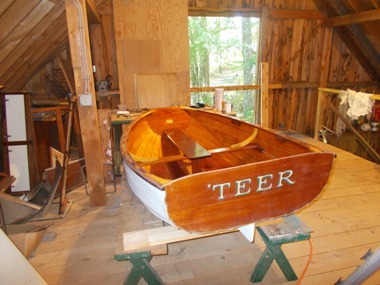 Just in time to close out another good year for 'TEER, the journal of the Traditional Small Craft Association (The Ash Breeze) decided to publish an article about her. Click here to go there.